The SpeechMike Premium has reached its highest stage of evolution. 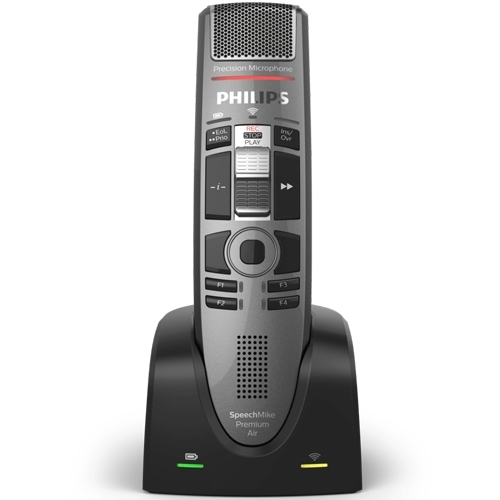 Benefit from all advantages of the industry leading dictation microphone, without the constraints of a cable. Record your voice using a premium decoupled studio-quality microphone with a built-in noise reduction filter and achieve exceptional speech recognition results. Thanks to the revolutionary patented lossless speech technology, the SpeechMike Premium Air offers maximum mobility without any compromises. The device achieves the same high speech recognition performance as the standard SpeechMike Premium with a cable. The SpeechMike Premium Air comes with a studio-quality microphone and a built-in triple layer noise reduction filter for clearest recordings and most accurate speech recognition results. The free-floating microphone is decoupled from the device’s housing, which guarantees that almost no background, touch, click, air or structure-borne noise is recorded. Being on the cutting edge of technology, the SpeechMike Premium Air comes with an integrated motion sensor, meaning it can be controlled by the movement of your hand. It detects when it’s put on the table, mutes the microphone, and once it is being picked up again it unmutes the microphone. In addition to that, custom events can be programmed, e.g., to pause and to continue the recording. Uncompressed wireless recording enables free movement and pacing whilst working. You can easily move up to 5 meters or 16 feet away from your workstation and your recordings are safely transmitted to your computer in highest quality, without any interruptions. The cutting edge technology ensures every word is captured from the moment you press record. The stable and innovative docking station provides wireless high-speed charging and easy pairing between your device and the docking station. Users can be flexible and work with various docking stations in different places. With an optional foot control connected, the docking station enables hands-free recording. You can freely configure the buttons on your device or use the pre-installed Secured Dragon Mode. This mode pre-configures the buttons, optimizing them for use with Dragon speech recognition software. It requires no additional driver installation, making set up easy, even in virtual environments. 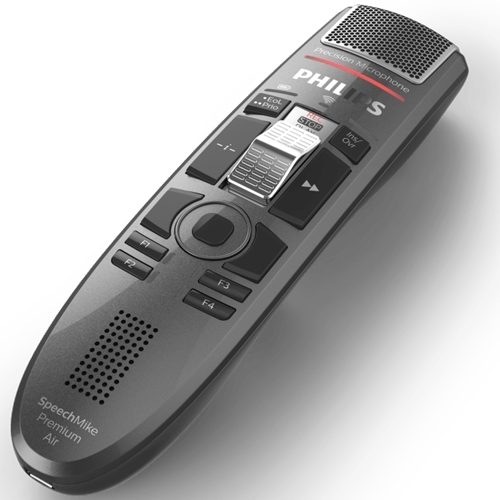 The SpeechMike Premium Air comes with slide-switch or push-button operation. The slide switch is ergonomically shaped with a softly ribbed surface for smooth tactile feedback and comfortable and intuitive utilization. In addition, our engineers implemented a millionfold proven contactless slider detection, making it completely wear-free for an extra-long lifetime. The housing of the SpeechMike Premium Air is made of antimicrobial synthetics that work against a wide range of different microorganisms such as bacteria, viruses, fungi or algae. The polished, high quality pearl metal surface also makes the device non-sensitive to touch noises and fingerprints. The device comes with a dust and dirt resistant touch sensor for superior quality. This allows the user to easily control and navigate within applications while recording, without having to switch between the mouse and microphone. An optional foot control can be connected directly to the docking station and used for comfortable hands-free recording control. Customers can upgrade from their previous SpeechMike model without installing additional software. For integrators, this means no changes need to be implemented and the existing SDK can be used. The SpeechMike Premium Air is compatible with Mac and Windows operating systems, as well as virtual environments such as Citrix, VM Ware and Hyper-V. 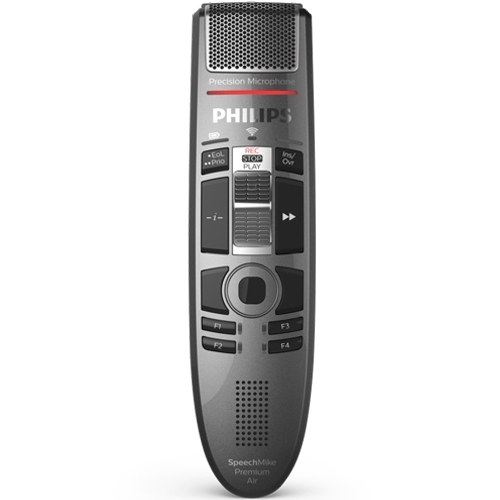 It can be configured using SpeechControl, the convenient Philips hardware management tool. The SMP4010 SpeechMike Premium Air is equipped with seamless slide-switch operation for optimized workflow. Well here it is, the new SpeechMike Premium Air and of course, we had to put it through the test! The latest in Wireless Desktop Technology with all of the fantastic features of a tethered SpeechMike Premium including antimicrobial surface, integrated motion sensor, high quality stereo microphone for high accuracy speech recognition and now with touch sensor control! 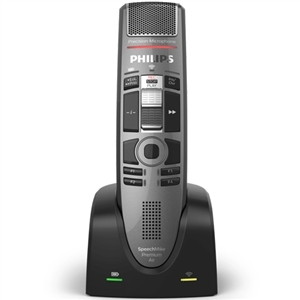 Two Models available with the Philips SpeechMike Premium Air SMP4000 including push button operation and the SMP4010 with familiar slide control for intuitive operation. Both tried and tested by Speak-IT for use with Speech Recognition. Both awarded 6 Dragon Stars from Nuance the creators of Dragon Professional Speech recognition. In our opinion, this is one of the best Microphones available on the market. Its sturdy build has a super quality feel and alongside the docking station feels like a robust and well-built product. The wireless transmission comes from a new technology that far out-performs any Bluetooth connectivity that we have seen in previous models and makes for a fast and reliable connection which removes any lagging or latency from the SpeechMike to the PC. 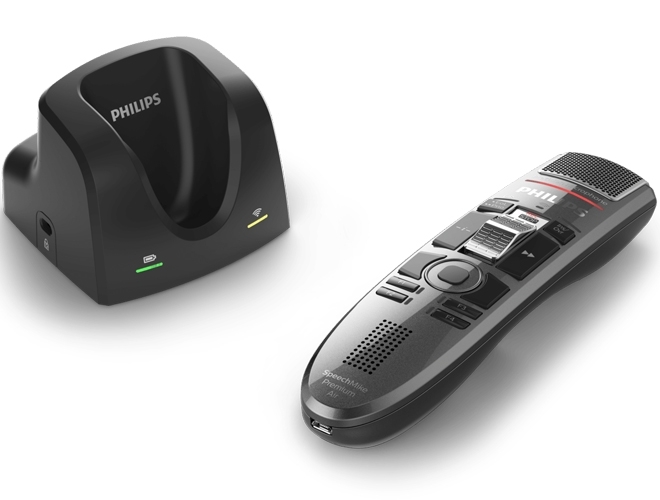 This latest device from Philips Speech Processing really tops the icing on the cake for their full range of Voice Products to suit a wide range of users.